Lizzie decided she wanted to take a ride on the school bus, too bad this one won’t get her there very fast. Homemade popsicles with my new Zoku. Mother’s Day presents that involve cold things for hot Texas weather ROCK! My girls are finally entertaining each other. I only had to follow behind to make sure Lizzie didn’t bop her head into the wall. Lots of giggles, happy girls. Big sister so sick that she feel asleep waiting for the doctor. Strep is yucky. One of your babies having to get a shot is yucky. Go away germs! Little sister managed to go through my entire purse and all of the cabinets in the room. Can I send my husband to baby-proof one room that they will then put us in each time??? Let’s just not tell the doctor about a few new pen marks that we ‘co-or’ on his floor. Ooopps! I love toddler words for things. They make so much sense. Eyes = sunglasses in her world. LOVE it! The big one barely left the couch all day and wanted me to sit with her. Good thing I had a few knitting projects and an Apple TV loaded with movies so I never had to get up. Little sister took a nice long nap. Guess destroying a doctor’s office will wear you out. Pink lemonade = ‘me-cine’ in her world. Not sure, but she still drinks it. Tried hard to keep them apart to avoid germies spread, but little sister couldn’t help but love on big sister. End of Year gift for sweet preschool teachers. Inside is yummy Ghirardelli mint chocolates and a Starbucks gift card. Chocolate and coffee = heaven in my world. Thank you to the sweet women who loved on my baby all year! Next is one of the projects for my Etsy shop I worked on while snuggling with a sick kid. More to come on that soon. Perfecting the french braid. Not so great, but getting better. She doesn’t care. She thinks it’s rainbows and unicorns perfect. I love that she loves without seeing flaws! What happened around your house this week? Elizabeth has learned quite a few words lately, but I had to laugh when she dumped out the crayons, smiled, and said 'mess'. Oh yes my dear, you are a mess! It's so hard to believe that this girl is done with her second year of preschool and only has one year left. My sweet girl who, after Ya-Ya did it the other day, now wants her hair french braided everyday. It makes her look even more grown up than before. Slow down time and let me enjoy her like this a little longer! and then convincing your aunt to hold them while you proceed to dump them all out. Happiness is finding the perfect spot to watch TV. Elizabeth LOVES Bubble Guppies the TV show and can often be found like this when they are on. Cracks me up to find her like this. Hmmm.. wonder where she gets it from??? Taylor did a pretty good job of breaking me in for car rides when it comes to songs or car games. I swore Wheels on the Bus would never play on repeat again and I would make sure Lizzie was used to radio songs to give me a break from kids songs. Lizzie spends much more time in the car with me than Taylor ever did, but I never expected quite the input from her. With the increase of speech has come many comments from peanut gallery. 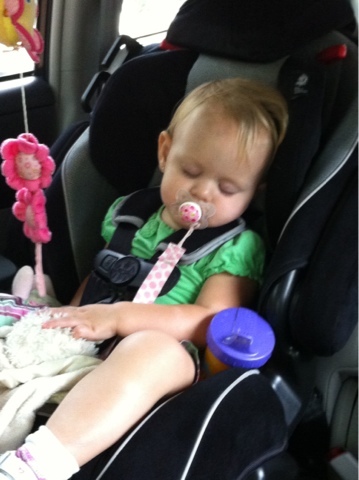 It is now not uncommon to hear 'song' as soon as Lizzie is strapped in her carseat. You also might here 'Noooooo' if it is not a song she wants to hear. Aka, no slow stuff, but rap , Lady Gaga, chipmunks, or any songs you can clap to are okay. Our newest comment is 'go, go, go' when I'm stopped at stop lights or stop signs. I'm cool with her loving Mommy's fast driving, but try explaining red lights to an 18 month old. Is it sad that I enjoy the few minutes she's asleep so I can listen so Cosmo radio??? A crazy week means a Momma that misses a few blogging/email deadlines. I love when random pictures turn out to be great shots. So many of my pictures of Taylor these days are of her in action and require too much background story. This one just shows you my beautiful girl. Not sure how it’s true that she’s already four and growing like crazy. Slow down time! Just let me love on her and enjoy her like this a little longer! About a month ago, Taylor was watching a cartoon that asked if she liked dogs. Her response was 'yeah, sort of'. This really describes how she feels about dogs, but she LOVES cats. Every morning our cat Tessa comes out to greet us as we take Taylor to preschool. While I get Lizzie in the car, Taylor and Tessa bond over purrs and pets. I love watching my girl with her cat.